Did you know that carrots are related to celery, celery root (celeriac), fennel, parsnips, and lots of herbs used for their foliage and/or seeds, including angelica, anise, caraway, coriander, cumin, chervil, cilantro, dill, lovage, and parsley? We also call plants in the Apiaceae family umbellifers because of their umbel-shaped blooms, which are like umbrellas. You can grow most of these plants in your own garden—some you can start right now for fall harvest! You can still plant carrots, dill, parsley, and parsnips (Pastinaca sativa) now through mid-August for a fall crop. 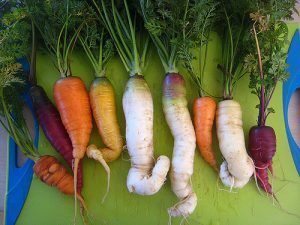 You can even leave your carrots and parsnips in the ground and harvest them as needed as long as temperatures stay above about 20F. Although you can often find parsley and other herbs as transplants, plan to grow Apiaceae from seed. Plant directly in the ground in a sunny spot. Although best in full sun, many will tolerate partial shade if you’re short on space. 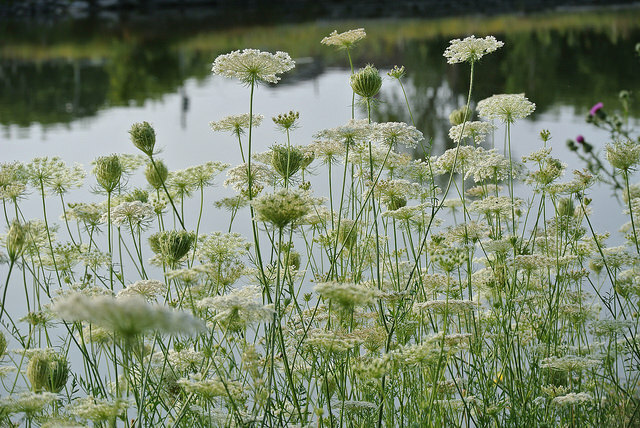 Although we grow most Apiaceae as annuals, many are biennials or even perennials. Annuals complete their life cycle in one season, while biennials form roots and leaves their first year, then flower and seed before dying in their second year. Perennials typically live for more than two years. Knowing the lifespan of the plants you are growing is important because you may need to leave them in in the ground beyond one season to harvest your desired crop; also, if you are buying transplants, beware! One spring I got a great deal on large parsley plants, only to have them immediately start to go to seed, showing their biennial nature. Anise, chervil, cilantro/coriander (yes, they are the same plant—the leaves are known as cilantro and the seeds are coriander), cumin, and dill are annuals. 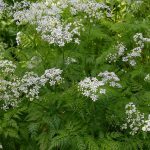 Angelica, caraway, carrots, celery, celeriac, parsley, and parsnips are biennials. Fennel and lovage are perennials. Water. Keep your planting moist until seeds sprout. Water regularly throughout the growing season. Thin/Weed. Knowing your crop seedlings from weeds is always important! Many Apiaceae have ferny foliage, which may help. Thinning is important for root crops, so leave at least an inch or two between carrots and parsnips. Weed often as pulling large weeds may damage your crop roots; cutting off weeds at the soil surface may help. Weeding after a rain and watering after weeding help avoid root damage. Fertilize. 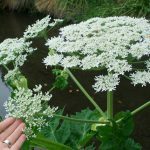 Apiaceae are not heavy feeders, but you want to see healthy foliage to produce roots and provide leaves and seeds in your herb crops, so some fertilizing during the season may be helpful. Insects and diseases to watch for. Armyworms, carrot worms, and leafhoppers may feed on your plants. Leafhoppers also spread aster yellows, which affect carrots and celery. Swallowtail butterfly larvae feed on dill, fennel, and parsley. There are some very toxic members of the Apiaceae family! Be careful around the leaves of garden parsnips, which can cause an allergic rash in some—and never eat parsnip leaves or stems. 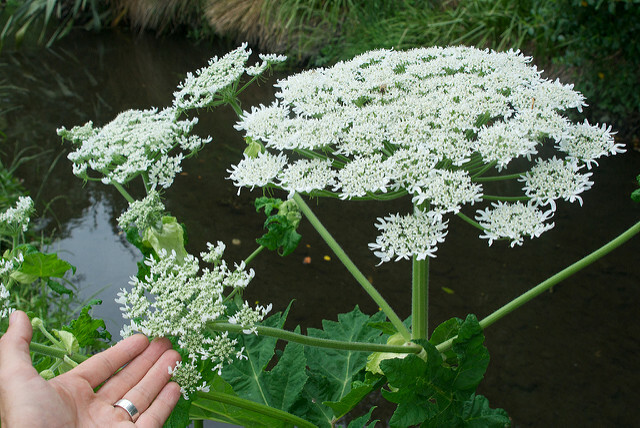 You may have heard about the giant hogweed (Heracleum mantegazzianum), which can cause blistering and burning skin reactions—much worse than poison ivy—and even blindness. 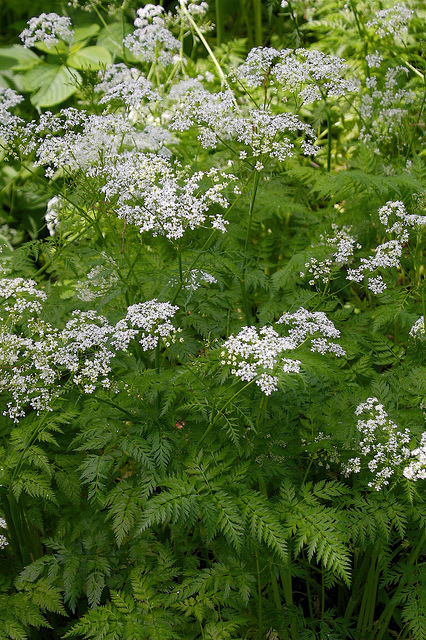 We recently identified poison hemlock (Conium maculatum) growing at our Extension office. This is another plant you don’t want in your landscape because eating any portion of the plant can be fatal! Even the wild carrot (Daucus carota) known as Queen Anne’s lace is considered a problematic invasive plant throughout the southeastern United States. 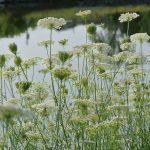 Remove it before it goes to seed if you have it in your landscape, but be sure of your identification—use extreme caution when handling unknown Apiaceae plants.